The ASUS WL-107 is based on Ralink RT2400 b wireless chipset. The ASUS WL-107 Cardbus Card utility release note and utility progrm in English, version 1.9.8.1.
a. 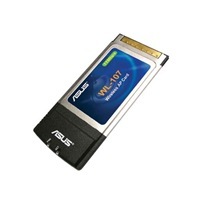 The ASUS WL-107 Cardbus Card utility progrm in English. The ASUS WL-107 Cardbus Card Station and SoftAP driver source for Linux, RT2400 b SoftAp driver for RT2400 b. Download (330.05 (KBytes), 2007/04/27 update) 1. Please read "Read Me" file first.